Smart Pills is a supplement designed to optimise brain function and promote mental efficiency. It is formulated from six different ingredients, including two renowned natural nootropics, Bacopa monnieri and Ginkgo biloba, vitamin B12 - now scientifically-recognised as playing a key role in the nervous system, caffeine, taurine and theanine. The combined scope of their effects enhances well-being and cognitive performance: memory, cerebral microcirculation, mental effort … They work symbiotically to provide the extra boost we need to be more focused and productive. Who is Smart Pills aimed at? view tasks to be accomplished in a clear-headed way (mental clarity). When is a good time to take Smart Pills? before a stressful event such as an oral presentation, competition, job interview, etc. when you need to take an important decision. More generally, Smart Pills can be taken when you need a little boost or an extra level of concentration. You can take one capsule in the morning or before periods of prolonged work and concentration. There’s also nothing to prevent you from taking it every day for extended periods. Smart Pills contains five main ingredients, all chosen for their scientifically-documented effects and absence of toxicity. As always, SuperSmart has taken the utmost care to use only the highest quality raw materials for each of these ingredients. The benefits of Bacopa monnieri are well-established in terms of improving the cognitive system and memory (1-6), as well as visual perception, attention and language (verbal understanding and vocabulary) and reducing impulsivity (7-8), improving concentration and reasoning (9), as well as alertness and speed of information-processing (10), associative memory (11), retention of new information (12) and even reducing the tendency to make mistakes (13-14). Its principal chemical components are triterpene saponins (bacoside A1, bacoside 13, bacopasaponins, jujubogenin), cucurbitacins, monnierasides, flavonoids (luteolin and quercetin), alkaloids and coumarins. 1) Improvement by bacosides of transmission of nerve impulses. These compounds repair damage to neurons by inducing kinase activity and neuron synthesis, and by restoring synaptic activity (16). They exert antioxidant effects at several levels in all areas of the brain, particularly in astrocytes and fibroblasts where they protect against damage to DNA (17). 2) Involvement in the GABAergic system (18). 3) Effect on glutamatergic transmission (19) (lowering glutamate levels). While the dose of a typical standardised extract usually contains 20% bacosides A, in Smart Pills it is standardised to 50% of these active compounds. The Smart Pills dose (300mg to be spread across the day) is the same as that used in clinical studies (20). This is an amino acid found in green tea and certain types of mushroom. A number of preliminary studies have suggested it has a relaxing effect on the nervous system (21-22). It may explain why drinking green tea every day helps to maintain mental alertness and improve cognitive performance (23) and memory. In research conducted in 2014, improved connections between neurons (called synapses) were observed in green tea consumers compared with controls (24). It also appears to stimulate blood flow in the brain (25). This is one of the most abundant free amino acids in the body: it is present in almost all tissues, particularly excitable tissues such as the muscles, retina and nervous system. The body is able to synthesise taurine itself in the liver and brain, but additional intake from the diet is necessary to prevent deficiency (26). Requirements for taurine are estimated to range from 40mg to 400mg a day depending on various parameters. Taurine has excellent bioavailability when ingested: it rapidly enters the bloodstream, crossing the blood-brain barrier with the aid of specific carriers to reach the brain parenchyma where it joins endogenously-produced taurine. It is concentrated in synapses in certain areas of the cerebral cortex where it acts as an inhibitory transmitter, preventing over-stimulation caused by high levels of amino acids (27). It also plays a role in long-term potentiation (LTP) – the significant and sustainable increase in synaptic efficacy – via induction of a cascade of molecular events. Methylcobalamine participates in neurotransmitter synthesis and helps maintain the myelin sheath in order to preserve the efficacy of nerve fibres. Recent studies have shown its benefits in increasing alertness and preventing various neurological problems. It is widely recognised for optimising nervous system function and helping to reduce nervous fatigue. As the body is unable to produce methylcobalamine, it has to be obtained from the diet. However, since it is available in very few foods and high oxidative stress levels increase the body’s requirements for vitamin B12, nutritional supplementation is an increasingly popular option. Present in tea and coffee, caffeine is an alkaloid from the methylxanthine family. It is rapidly metabolised by the body and deployed in all tissues including in the brain. Peak blood concentration is reached within 60 minutes of ingestion and it takes at least three hours for the body to eliminate one half of a dose. Evidence from dozens of studies, along with individual everyday use, proves beyond doubt that caffeine stimulates the central nervous system, attention, creativity, and mental activity, and helps counter drowsiness. However, it also influences thought development (cognition) by reducing reaction time (31), improving the execution of simple tasks, facilitating learning tasks (32) and improving the ability to retain information useful for accomplishing future tasks (33). For close to 2800 years, we’ve known about the medicinal properties of Ginkgo biloba, an ancient tree that has existed for some 300 million years. It is the leaves which are most highly-prized because of their rich content in terpenes, particularly ginkgolides and bilobalides, as well in various polyphenol and flavonol compounds. Extracts of Ginkgo biloba influence neuronal metabolism by improving the capture of glucose and oxygen. This is due to the action of bilobalides on the mitochondria, the small organelles involved in the conversion and use of energy. This same compound also prevents lipid peroxidation in the brain with the help of ginkgolides, by increasing the activity of glutathione transferase, an endogenous antioxidant. This effect is enhanced by flavonoids which protect brain cells from free radicals (34). Can I take two capsules a day? Smart Pills is formulated to cover a whole ‘work’ day (8 hours). It’s therefore possible to take one capsule in the morning and one in the evening if required. Can I take other supplements alongside Smart Pills? Smart Pills is not designed to meet our requirements for vitamins and micronutrients. It is therefore perfectly possible to take other supplements at the same time such as multivitamins and omega-3 fatty acids. In India, Bacopa monnieri is often combined with Withania somnifera (Ashwagandha) to improve memory and learning. Smart Pills can also be taken alongside our supplements Taurine 1000mg, Methylcobalamine 1mg or Ginkgo biloba 60mg. What other measures can be taken alongside supplementing with Smart Pills? Good quality sleep. Several studies have demonstrated the importance of sleep for memorising new information. Indeed, it’s during the hours of sleep that memory is consolidated. A poor night’s sleep before an important event may thus impair memory as well as alertness and concentration (35). A vitamin B-rich diet. The B group vitamins, particularly B1, B6, B9 and B12, play a key role in cognitive processes. Good hydration. Failure to stay well-hydrated (by drinking at least 2 litres of water a day) can impair concentration and alertness. Regular breaks. Several studies suggest that taking regular breaks boosts efficiency and productivity at work, provided you don’t allow yourself to become distracted or try to multi-task. Are there any risks or long-term side-effects associated with taking Smart Pills? 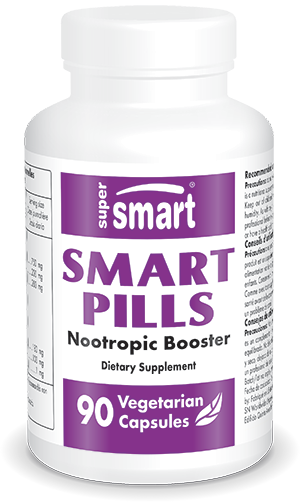 Smart Pills has absolutely nothing in common with the potentially dangerous nootropics sometimes used by students, like amphetamines and racetams. It contains natural extracts that have been used for centuries without showing any toxicity, as well as caffeine and taurine (the regular use of which is recognised as safe by the European Food Safety Authority (EFSA). It is thus completely safe at recommended doses. Downey, L.A.; Kean, J.; Nemeh, F.; Lau, A.; Poll, A.; Gregory, R.; Murray, M.; Rourke, J.; Patak, B.; Pase, M.; et al. An acute, double-blind, placebo-controlled crossover study of 320 mg and 640 mg doses of a special extract of Bacopa monnieri (CDRI 08) on sustained cognitive performance. Phytother. Res. 2013, 27, 1407–1413. Benson, S.; Downey, L.A.; Stough, C.; Wetherell, M.; Zangara, A.; Scholey, A. An acute, double-blind, placebo-controlled cross-over study of 320 mg and 640 mg doses of Bacopa monnieri (CDRI 08) on multitasking stress reactivity and mood. Phytother. Res. PTR 2014, 28, 551–559. Stough, C.; Lloyd, J.; Clarke, J.; Downey, L.A.; Hutchison, C.W. ; Rodgers, T.; Nathan, P.J. The chronic effects of an extract of Bacopa monniera (Brahmi) on cognitive function in healthy human subjects. Psychopharmacology, 2001, 156, 481–484. Morgan, A.; Stevens, J. Does Bacopa monnieri improve memory performance in older persons? Results of a randomized, placebo-controlled, double-blind trial. J. Altern. Complement. Med. 2010, 16, 753–759. Raghav, S.; Singh, H.; Dalal, J.S. Randomized controlled trial of standardized Bacopa monniera extract in age-associated memory impairment. Indian J. Psychiatry 2006, 48, 238–242. Barbhaiya, H.C.; Desai, R.P. ; Saxena, V.S. ; Pravina, K.; Wasim, P.; Geetharani, P.; Allan, J.J.; Venkateshwarlu, K.; Amit, A. Efficacy and tolerability of bacomind® on memory improvement in elderly participants—A double blind placebo controlled study. J. Pharmacol. Toxicol. 2008, 3, 425–434. Kean, J.D. ; Downey, L.A.; Stough, C. A systematic review of the ayurvedic medicinal herb Bacopa monnieri in child and adolescent populations. Complement. Ther. Med. 2016, 29, 56–62. Downey, LA Kean, J et al. An acute, double-blind, placebo-controlled crossover study of 320 mg and 640 mg doses of a special extract of Bacopa monnieri (CDRI 08) on sustained cognitive performance. Phytother. Res. 2013, 27, 1407–1413. Dave, U.; Chauvan, V.; Dalvi, J. Evaluation of BR-16a (Mentat) in cognitive and behavioural dysfunction of mentally retarded children a placebo-controlled study. Indian J. Pediatr. 1993, 60, 423–428. Dutta, B.; Barua, T.K. ; Ray, J.; Adhikari, A.; Biswas, S.; Banerjee, S.; Roy, A.; Debnath, P.K. A study of evaluation of safety and efficacy of memomet, a multi herbal formulation (memomet) in the treatment of behavioural disorder in children. Int. J. Res. Pharm. Sci. 2012, 3, 282–286. Roodenrys A, Booth D, Bulzomi A, Phipps A, Micallef C, Smoker J. Chronic effects of Brahmi (Bacopa monnieri) on human memory. Neuropsychopharmacol 2002;27:279-81. Singh HK, Dhawan BN. Neuropsychopharmacological effects of the Ayurvedic nootropic Bacopa monniera Linn. (Brahmi). Ind J Pharmacol 1997;29:S359-S65. Singh HK, Shanker G, Patnaik GK. Neuropharmacological | January-March 2010 | International Journal of Green Pharmacy 8 and anti-stress effects of bacosides: a memory enhancer. Ind J Pharmacol 1996;28:47. Hota SK, Barhwal K, Baitharu I, Prasad D, Singh S, Ilavazhagan. G. Bacopa monniera leaf extract ameliorates hypobaric hypoxia induced spatial memory impairment. Neurobiology of Disease 2009;34:23-39. No author listed. Bacopa Monniera. Monograph. Alt Med Rev 2004;9:79-85. Gray MA, Oliver C, Liley DT, Harrison BJ, Bartholomeusz CF, Phan KL, Nathan PJ. The acute effects of L-theanine in comparison with alprazolam on anticipatory anxiety in humans. LHumPsychopharmacol. 2004 Oct;19(7):457-65. Durlach PJ. The effects of a low dose of caffeine on cognitive performance. Psychopharmacology (Berl) 1998;140:116-9. Smith A. Effects of caffeine in chewing gum on mood and attention. Hum Psychopharmacol. 2009 Apr;24(3):239-47. Adan A, Prat G, Fabbri M, Sànchez-Turet M. Early effects of caffeinated and decaffeinated coffee on subjective state and gender differences. Prog Neuropsychopharmacol Biol Psychiatry. 2008 Oct 1;32(7):1698-703. Epub 2008 Jul 15. Ker K, Edwards PJ, Felix LM, Blackhall K, Roberts I. Caffeine for the prevention of injuries and errors in shift workers. Cochrane Database Syst Rev. 2010 May 12;5:CD008508. Review. Jarvis MJ. Does caffeine intake enhance absolute levels of cognitive performance? Psychopharmacology (Berl). 1993;110(1-2):45-52. Smit HJ, Rogers PJ. Effects of low doses of caffeine on cognitive performance, mood and thirst in low and higher caffeine consumers. Psychopharmacology (Berl). 2000 Oct;152(2):167-73. Nehlig A. Is caffeine a cognitive enhancer? J Alzheimers Dis. 2010;20 Suppl 1:S85-94. Review. Tracy TS. Ginkgo biloba. in: Herbal Products: Toxicology and Clinical Pharmacology. 2e édition. Tracy T S, Kingston RL Eds Humana Press Inc. USA, 2007. Ellenbogen JM, Hulbert JC, Stickgold R, Dinges DF, Thompson-Schill SL. Interfering with theories of sleep and memory: sleep, declarative memory, and associative interference, Curr Biol., 2006 Jul 11;16(13):1290-4. Other ingredients : acacia gum.